I know this very nice lady. Her name is S.S. (have to keep it private.) She is a major foodie and has traveled all over eating some of the best foods there is. Do you want to know what she said about my corned beef? She said that it equals, if not surpasses, corned beef she has had in New York City. Can you believe that? What a great compliment. 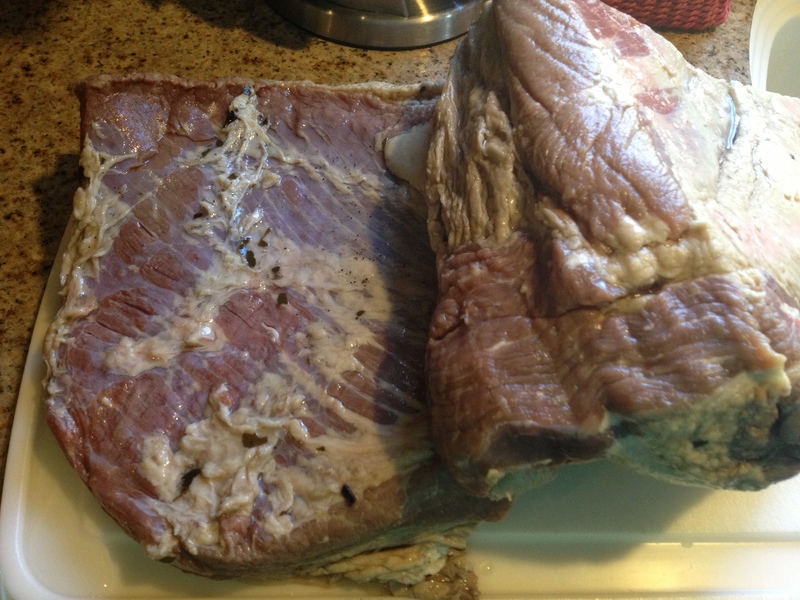 It was my first try at corned beef. In fact, it was my first shot at leaving anything in a brine. For 5 days that meat soaked in all the goodness of the bring that I had created. Then on the 6th day I rinsed and I boiled. (By the way, on the 7th day I drank a beer with the profit I made from the person who bought the meat from me. For privacy sake I can not tell you that I made a ton of money on 13lbs of meat—can’t tell you that.) The aroma in the house was awesome as the meat became tender during the boil. I tried a little bit of the meat when it was all done and I loved it. Truthfully I never had corned beef before; it was never on the menu at my house. But it will be from now on. There is no reason that a cheap cut of meat, like brisket, can not make its way to my plate more often if all you do is soak and boil. Get over my insane fear of anything dead with a head on it. I mean really, I chose not to go to medical school becasue I found out that I hate dead things with a head. I could easily work on a person’s heart if it was still beating, but as soon as it stops and the person is dead (or animal in this case) I get freaked out. But I am going to get over that stupid fear (even though one of the ducks is looking at me through the bag). When I get over my fear I am going to make the best duck confit you have ever had. Or maybe Peking duck. We will see. More later my friends and remember you can save money and your health by buying bulk and breaking down your own food. So this latest little experiment has taken me a few days. I used the master list for sausage making and added my own flavors. I will tell you more. But I’m sitting next to my smoker, it’s hot and I need water. But I wanted to at least post this link to a Sausage Documentary my six year old did while I was stuffing the casings. I started my mission yesterday. 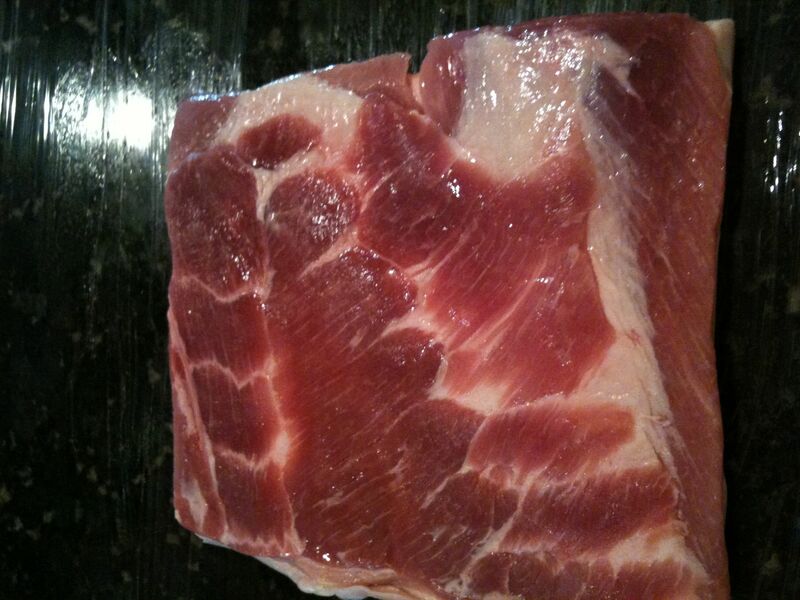 Countdown to homemade, home smoked bacon has begun. I posted the recipe here on this blog under the title recipe, but I am going to give you the condensed account of what has happened so far. I stated out with 8 pounds of pork belly. 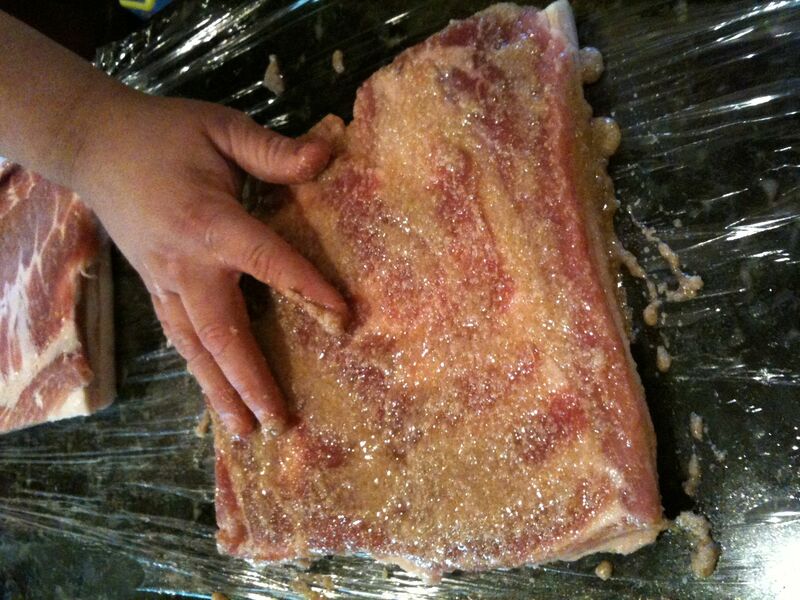 I have never worked with pork belly before and it is a little odd working with fat, meat, and skin of an animal that really looks like the fat, meat, and skin of an animal as if it was alive. It did not bug me as much as I thought it might. I am thinking maybe this is the hobby for me. I was also thinking maybe I could go hunting one day. This is not that bad. So I took my two slabs of meat and put them on a plastic wrapped counter a la Dexter Morgan. (Some of you might get that reference) I let them sit t here while I mixed up the salt, the Pink Salt, brown sugar, and maple syrup. Before go on I want to explain to you that Nikki and I were worried about using Pink Salt. Pink Salt is poisonous and has to be used with extreme caution. At the same time it has to be used when one is curing meat to prevent botulism and other yucky things. ( http://en.wikipedia.org/wiki/Curing_salt ) But still, Nikki and I were worried and being very careful to get the exact amount. Plus understand this, when I am ready to cook it will be washed off and there is only a little bit being used. Now back to the action. So I have my rub all mixed up and I have the two good-looking slabs just waiting to be rubbed and bagged. So that is what I did. I rubbed my meat really well with my mixture. (No joking sis.) I had to make sure I got enough mixture to cover all of the meat. Next I bagged the slabs in some of the biggest Ziplock bags I have ever seen. Almost immediately that salt started pulling out the moister of the meat to make its own brine. I have to flip meat every two days for a total of 7 days. This way the bring is sure to be in contact with every part of the meat. After that I will wash off the salts, pat dry, and allow to dry in the fridge for 24 hours before I hot smoke it with some cherry wood and rosemary. 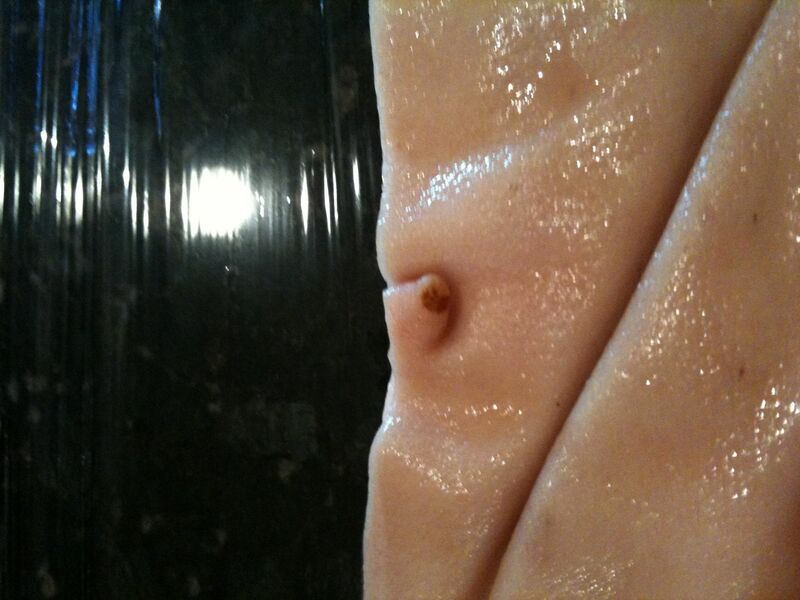 Then there will be BACON. Stay tuned for day three when I show you what the brine and the bacon looks like as I flip it. 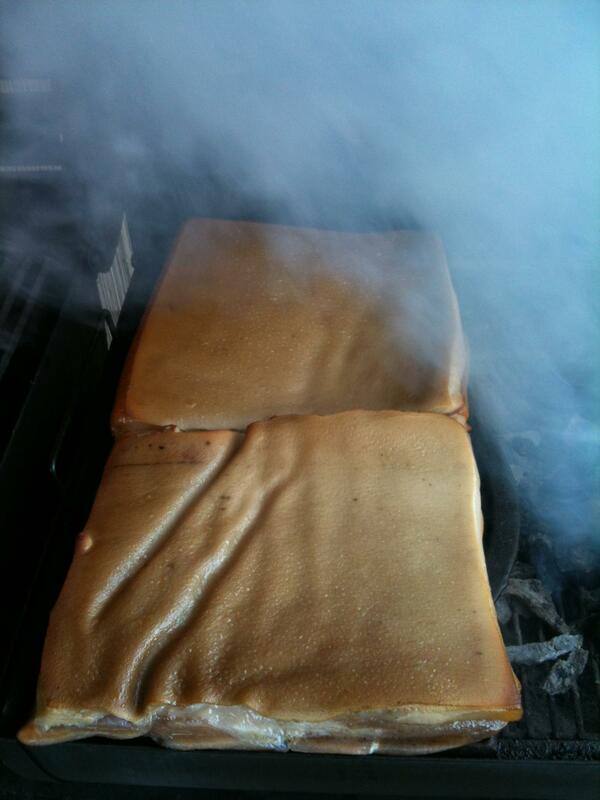 So as you may know know, I’m starting to smoke and cure meat. I want to do this because sausage making, curing, smoking is an art form and I don’t want it to disappear with all this pre packaged stuff. I also wanted to save money. By doing this at home the costs go way down. So tonight I got serious. I started to look up “dealers” around my home. By dealers I mean a butcher. I would love to break down my own meat but alas I don’t have the room. 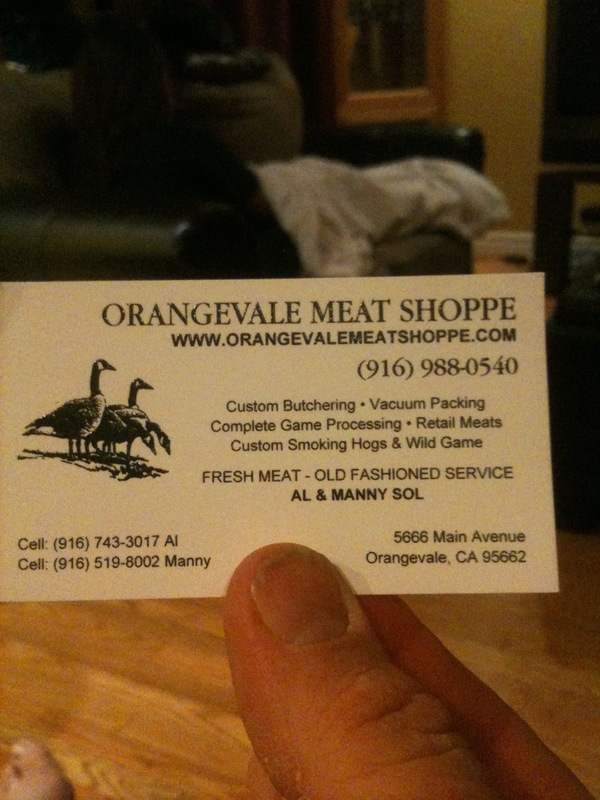 So my search has led me to Orangevale Meat Shoppe. I went in tonight and was happy to find a butcher shop that was clean, well stocked, and friendly. I know that this will be the place for me.